Idéal emplacement en bord de mer avec vue panoramique. Cette maison de trois chambres dispose d'une chambre et salle de bains sur chacun des trois niveaux et peut accueillir six confortablement: Master Suite avec lit Queen au niveau de l'étage supérieur; Chambre double au niveau intermédiaire; chambre avec deux lits doubles au niveau inférieur. Cuisine à aire ouverte avec bar, salon et salle à manger sur la mi-niveau, avec des escaliers menant à une chambre au dernier étage den / TV. Avec ses vues ouvert sur trois côtés de la maison, toutes les pièces principales ont une vue sur la crique privée et l'océan. Il ya de grands ponts extérieurs et l'eau est accessible à partir de la côte rocheuse du jardin. The property was very nice. Watching the sunset from the deck was fantastic! We enjoyed our one week stay at Paul's cottage in East River NS. We are a family of two adults and a teenager who enjoyed having each our own room and private bathroom all well appointed, clean and comfortable. The kitchen had all you need to prepare great food and the BBQ on the deck made perfect hamburgers. Plan getting your groceries as the Sobeys and liquor store is at about half an hour from the cottage. The view was stunning every day so we took many atmosphere pictures of the low and high tides as well as colorful sunsets. We even had bird visitors like a Hummingbird and a Blue Jay! We went over to Halifax twice as it is a 50 minutes drive which is not bad. We visited the Maritime Museum, Botanical Garden, NS Art Gallery, and dined of lobster right off the boardwalk. We also visited Lunenburg to see the Bluenose II schooner and took a two-hour ride on the ship Eastern Star where we had a great time, then we visited the Ironworks Distillery to taste and buy artisanal spirit plus a wonderful rum. We enjoyed speaking to a local watercolour painting artist in her studio at the Gail Patriarche Gallery which overlooks the harbour. The beach was really near the cottage and the perfect place to soak up the sun enjoying the sound of the waves. At night we relaxed at the cottage reading or watching a movie with popcorn. Thank you Paul for making our stay comfortable, relaxing and worry free! Lovely deck view, well maintained and comfortable. The home is located in a lovely cove. The property was well maintained. Was a touch crowded for 8 people. Small problem was quickly fixed. Kayaking was fun and most tourist sites were within reasonable distance. We would recommended this site to our friends. Paul was personable and responsive. This house was perfect for us. We took daytrips to Halifax and Lunenburg. But we also would just stay at the house on other days. Nothing beats eating on the deck and watching the sunset over the ocean. And it was nice to sleep with the windows open and hear the ocean and little creek. I haven’t slept so well in forever. 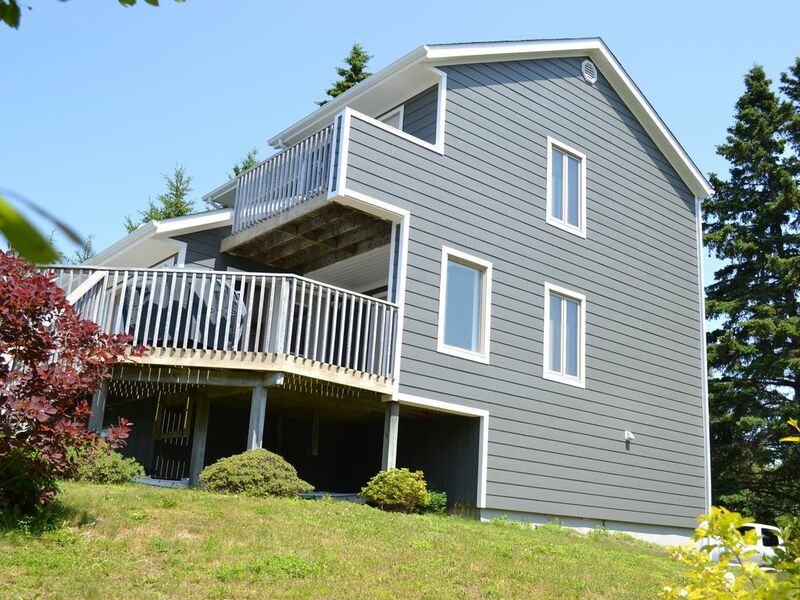 Perfect oceanfront location for your next South Shore vacation. We thoroughly enjoyed our stay. This house had all the comforts of home and an amazing view that we enjoyed from morning to night. Getting to the water was a bIt treacherous; however there are beautiful beaches close by. Great place for someone looking for a quiet place to unwind. The location is breathtaking. Two bedrooms have their own balcony and sitting room. The house has a few little quirks but our stay was perfect. Oceanside est à East River, qui est une petite communauté, côtière située près du village balnéaire historique de Chester, le long de la route panoramique phare de la Rive-Sud. Il ya des plages de sable à proximité, notamment Meisner, Cook et aussi Bayswater. Halifax se trouve à environ 40 minutes; le site du patrimoine mondial de l'UNESCO de la vieille ville de Lunenburg, Mahone Bay et le pittoresque de Peggy Cove sont également accessibles en voiture. 50% of net rental required to confirm booking. Remainder, including Damage Deposit, 30 days prior to Check In date.